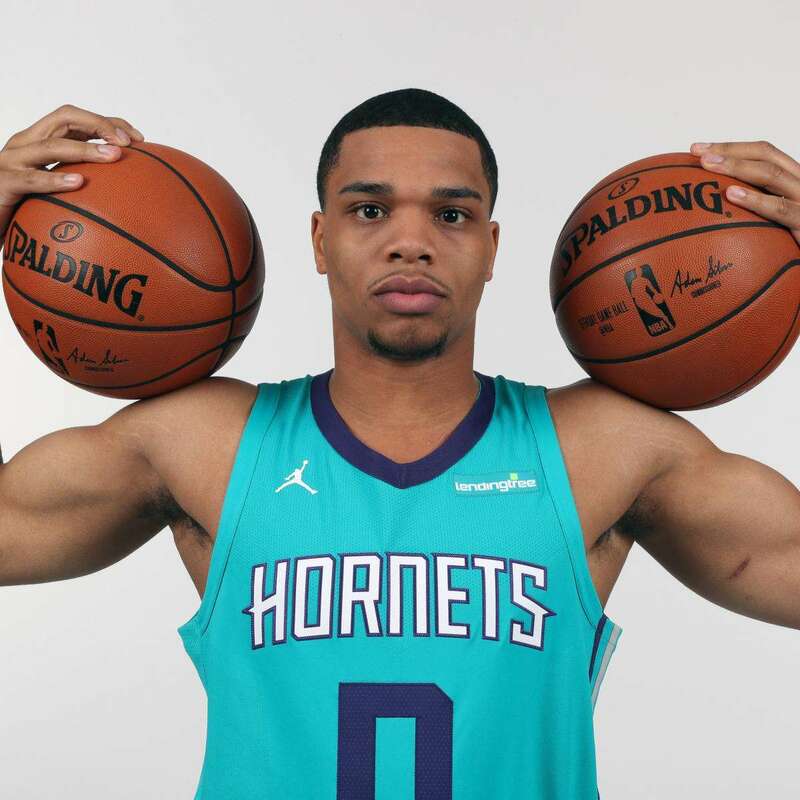 Miles Bridges, the rookie Small Forward and human highlight reel, is the future of the Charlotte Hornets. The past two seasons the Hornets have finished 36-46. Just good enough to land picks outside the top 10 of the NBA draft. Not bad enough to be in a position to have good shot at a ping pong ball landing them in the top 3 picks, usually associated with a franchise changing talent. After Miles Freshman year at Michigan State, the Sparty nation dreamed of what could be. Miles answered reporter’s questions of an early departure with a response promising to stay 4 years and get a degree. Luckily for Hornets fans, he departed after his second year. The move to stay for a second season in East Lansing is not one that paid dividends. Miles saw his stock drop as his points per game modestly rose from 16.9 to 17.1 points per game, and he saw a decrease in assists, blocks, and steals. MSU was overshadowed by allegations against former MSU players and Tom Izzo’s continued questioning by the media regarding his players misconduct off the court ,and what he knew while they were playing. But let’s get back to the future, because that is only part of the narrative of why the Charlotte Hornets got the steal of the draft. The story starts with the 1995 Class A State Champs Flint Northern Vikings in Michigan where his Dad Raymond who was part of the beginning of a basketball legacy. You’ve probably never heard of Raymond, but he was part of the Flint Renaissance lead by by the Flintstones. Flint Northern was lead that year by Junior point guard Mateen Cleaves, and Senior Power Forward Antonio Smith. Down the road at Flint Southwestern was Morris Peterson, and Charlie Bell. Peterson and Smith decided to play for new coach Tom Izzo in 1995. Mateen Cleaves was a battle between Michigan and Michigan State. In Mateen’s Senior year he was part of a very publicized car crash with Michigan’s Robert Traylor, Mo Taylor, and Louis Bullock in a recruiting trip. The car wasn’t registered correctly to any of the players which lead to the investigation and subsequent punishment of Michigan basketball. Life might be different for all if Marty McFly could have stopped that crash, and Mateen ends up choosing Michigan fresh off the run of the Fab Five. The rest of story is history and a windfall for Tom Izzo. Mateen chose MSU, and two years later so did Charlie Bell from Flint Southwestern. This is the basketball equivalent of 4 players in 3 years going to the NBA from a significantly more economically challenged version High Point. The Spartans later won a National Championship with the Flintstones, and began an improbable run as the best basketball program in the Big Ten for the past two decades. MSU began to rely on its Flint pipeline of tough gritty players that the city fully embraced. Fast forward to 1998 and baby Miles Bridges enters the world, grows into a top 10 recruit in 2016, a McDonald’s All American, and an enormous recruiting victory ultimately for MSU. Was there really ever a choice for Miles? MSU seemed to be his destiny given past Flint talent. So the Hornets drafted an absolute man-child, a dunking machine, a tough player who grew up in a city that is a basketball factory with Championship pedigree. That same town is consistently a FBIs top 10 most dangerous city, and still has a water crisis today. To see Flint and know its basketball tradition sets the stage now for Miles to be the most prolific legend to come from the city. So far, he hasn’t disappointed fans. He has been featured on ESPN for several of his powerful athletic dunks. Much like Draymond Green, his game includes some finesse passing, and hard nosed rebounding. He is also a natural leader. The controversy for some of the Hornets faithful is why the Hornets have elected to bring Miles along intentionally slowly, coming of the bench to spell MKG. As the season goes on, it will likely be tougher and tougher to leave Miles on the bench. He is already looked at as an early Rookie of the year of the year candidate. I expect he’ll finish the season padding the stat sheet and being in the top 3 players for Points, Rebounds, and Assists. His game favors the NBA style of play where he can standout athletically outside an Izzo system based on defensive basketball. Make no mistake Charlotte should be very excited with its Future star. I suspect his career might even land him in a Sports Almanac one day.